Who wants to carry 5-10 pounds of chocolate around while walking 3 miles? Not me. Cast Members are often more generous later in the party. I filled my bag last year in ONE stop at 11:00pm. Of course, I had a backpack so I refilled it later. Don’t waste your good character meet times standing in line for candy. Early in the party the lines may take up to 5 minutes to go through. Late in the party, you’ll walk right in. If you are traveling by air to Orlando, bring an extra suitcase just for your candy bounty. The lower storage area of a stroller makes an excellent candy stash area or bring along a backpack. Most of the parties are quite hot, so the chocolate items may melt, causing little Junior to be coated in milk chocolatey goodness. The trail at Splash Mountain is a great places to get lots of candy. I don’t visit the “trail” at the Liberty Square Riverboat because it only has one distribution can for such a long walk. Pinocchio’s Village Haus gives out chewy Werthers, yummy! See a Cast Member or visit one of the Allergy Friendly locations to receive a TEAL treat bag. When you use this bag to trick or treat, you’ll be given TEAL TOKENS which you can redeem at any of the Allergy Friendly centers for special treats. Do they allow you to trick or treat at a stop more than once. .i.e.at the beginning of the party and at the end? What about the trail between Space mtn and Fantasyland? 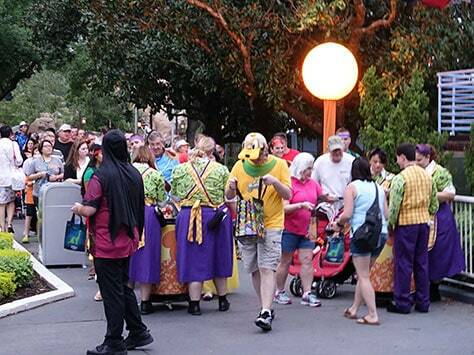 Does Disney provide a bag for you or do you need to bring your own to trick or treat? Plan on doing this in 2014…Have a schedule of who, what’s, when, & where’s??? Click on the links at the top and use my Character Locator app for actual character schedules. Was wondering if you knew anything about Trick-or-Treating in the Tiki Room, it seems like maybe it’s a new location for this year’s party since it’s not on this list. Thanks! Didn’t see that when I attended the party.